For Commercial Facilities, Condos, Churches, Funeral Homes, Offices, Shopping Centers, Schools, Restaurants, Retailers, Apartments and Supermarkets. The parking lot striping also helps in improving the flow of traffic in the parking lot. 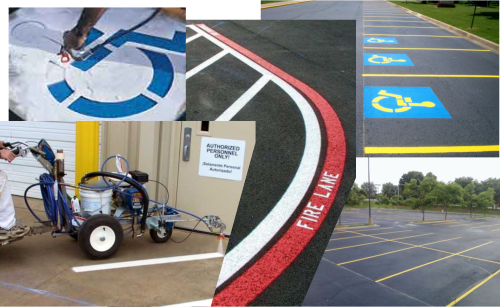 The parking lot striping attracts and helps customers of an establishment, making the grounds look professional and clean. Make A Great Impression Every Time! Your parking lot is the first thing your customers and visitors see at your facility. And nothing looks as good as a freshly striped lot. Bright, clean markings on well-maintained pavement make your lot look organized and attractive. A good-looking parking lot sends the message that your organization is efficient and well maintained. It's the first impression you give, so why not make it your best impression? Some of the most creative work that we have done has been with our motorcycle stencils. We use our motorcycle custom made stencils by Parking Lot Striping to create a true work of art in your designated area for your motorcycle parking. Most of your Customers that ride Motorcycles prefer to park their Cycles where they can keep an eye on them as close to their view as possible. Get your business noticed by adding “Curb Appeal” and customizing your parking lot area for your Motorcycle Customers. Many to choose from! Click the thumbs to explore. Make a favorable impression to your customers, employees, tenants and other visitors using your facility? Comply with the Americans with Disabilities Act? Clearly marked stalls, Handicap Spaces, Directional Arrows, Enhanced traffic flow. We are fully equipped with the tools necessary to service these tasks up to state standard requirements. Our estimates are tailored to fit your needs. We can install the sign posts in landscape areas, in asphalt pavement, and in concrete pavement. 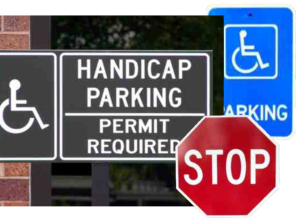 The requirement for a vertically mounted sign for each accessible parking space is at least 60 inches above the pavement. We have many signages to choose from. Encore Post Guards are designed with smooth slides and two reflective stripes recessed near the rounded top. 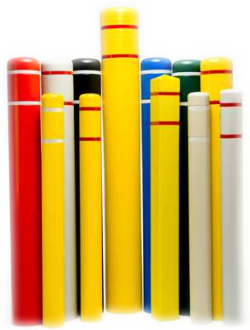 The High Density Polyethylene post covers are durable, ultraviolet resistant, and withstand extreme temperatures. They save time and costs by eliminating scraping rusty traffic posts and constant repainting Striping is available in red, white/silver, blue or orange. Post Guard is available in black, gray, yellow, red, white, blue, and brown. We can furnish and install Encore Posts Guards for less than the cost of priming and painting these posts.